Me and Neil Hanging Out With…. 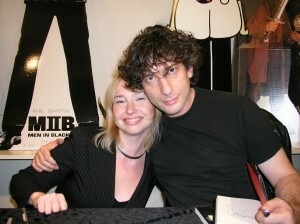 Saturday I went to listen to Neil Gaiman at Science Fiction bokhandeln and got my copy of Coraline signed. I finished reading the book this morning and I enjoyed it enormously (but it’s very creepy). It somehow made me remember the girl I was when I was about eight or nine. At that time my favourite book was The Witches by Roald Dahl, a book I can still read over and over again.